Photo of Zuzka's vessels on display. Hi Zuzka, can you tell us a bit about your background and what motivated you to become an artist? I have been drawing and painting ever since I can remember, so I never woke up one day and thought to myself that I want to become an artist, it was just something that was always a part of me. When I was a child, I used to lay on my back and draw on the of the backside of a wooden table in the living room. My parents didn’t discover that until we moved. They wanted me to play the piano. I kept telling them I wanted art lessons, so eventually, I went every weekend to a Czech artist’s studio to learn how to draw. One thing that really stood out to me is that he took away my eraser. The other thing I remember is that he told me to never to become an artist because it was a very difficult life. You make paintings and ceramics, and the two groups of work are quite different from each other! Can you tell us more about when you started working in each medium, and how the style for each evolved over time? I’ve been painting for such a long time. I honestly can’t remember a time in my life where I wasn’t painting or drawing. The ceramics is very recent. I’ve only been doing the ceramics for about two years. The painting style has changed a lot over time. It’s a lot more graphic now. Because the ceramics is so new, I’m still figuring things out. Can you talk a bit about the differences in the aesthetic qualities between the work? What about each medium makes them so different for you? I think this has more to do with differences in the amount of time I have spent with each medium and the approach to each. The painting stems from a progression of working out ideas over many years. When I started the ceramics, I wanted to be a beginner again - to be bad at something. I was approaching it in a more playful manner and just having fun and seeing what happens- it’s more spontaneous. Also, a big difference with the painting is that what you see is what you get. I can make changes and see them immediately. In ceramics, once you put the work in the kiln, there are a lot of factors that are out of your control. Little things like position placement in the kiln and slight variations in temperature can completely change the piece. There’s a certain element of magic in it. How do your practices for each type of work differ? Do you work in the same space for each? In an ideal world, I would have one singular large studio for both the ceramics and the painting separated by some kind of sliding door. At the moment though, I am doing the ceramic work out of the garage space that a friend and I cleaned out and made into a functional studio. My painting studio is located in an industrial complex which rents spaces to other artists or small businesses. On the subject of studios, what type of studio scenario do you need to get work done? Can you tell us a bit about your workspace? What are absolute necessities? I don’t need anything fancy to get painting work done-just some good lighting, a wall, and a table. My painting workspace is about a 12’ x 15’ studio. I do all of my painting on one wall that is just across from the main door. As far as for the ceramics…you need a lot more equipment. I need my wheel, work tables, shelves, and the firing often happens with a group of people, so you need friends and a community. It can be challenging to work in the painting studio because there are is a small hair salon across the hall and a musician practicing next door. It’s sometimes difficult to ignore some of the conversations and music from the other spaces, so I wear headphones or earplugs. As far as what supports my groove, it would be having some good music on, ample snacks on hand, and just a general feeling of positivity and strength. Can you walk us through your creative process and planning stages for the current paintings? Is drawing a part of your process? I work out most of the compositions in a sketchbook by cutting out colored paper or using watercolor. I consider it a type of drawing, but I also draw in more traditional ways. I have a lot of sketchbooks and scraps of paper in my studio. At the moment, I am particularly interested in the shapes of tropical subject matter like the leaves of palm trees and saw palmettos for example. In your website archive, you also have a large group of work based on kaleidoscopic imagery, which is also very different from the others series stylistically. Can you talk a bit about the freedom of varying subject matter and style between series? Have you always worked in this way? I consider the varying series of works as development and exploration towards something greater. I have always worked in a free manner. Right now, I feel I am in a very good place with the paintings, but I don’t think I could have arrived there without doing the works prior. There is a very digital effect in your paintings, is there a computer involved in the process or specific technology or tool involved in their making that gives this effect? The background of the works is a very bright white and worked to an eggshell smooth finish. I’ve developed a very specific technique in laying down the ground I paint on. I also like a clean hard edge with my shapes, so I have to tape them off. The entire process is very labor intensive and in person people usually think the shapes are collaged on, rather than painted. However, when I photograph the work, it is almost impossible to convey the interaction of the shapes against the white space, so I do my best and it makes them seem more digital. I think this is why it’s so important to see the work in person. Can you tell us more about the water media collages/paintings that you made in 2016? Were they an influence to your current paintings? Yes. Those water media works are also all painted rather than collaged. They were a bridge between some of the kaleidoscopic work and the current pieces. I started thinking about breaking up space and investigating the idea of modular painting and design. I was ready to break free from the symmetry of the kaleidoscopic works. What are some of your influences for the ceramic work? 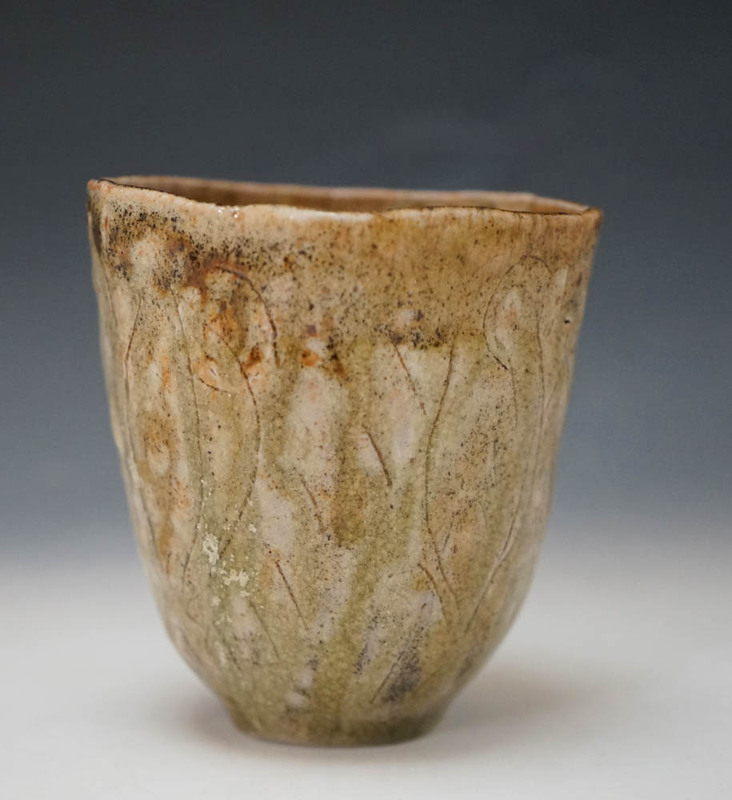 I am interested in the work of Lucie Rie and Korean ceramics. 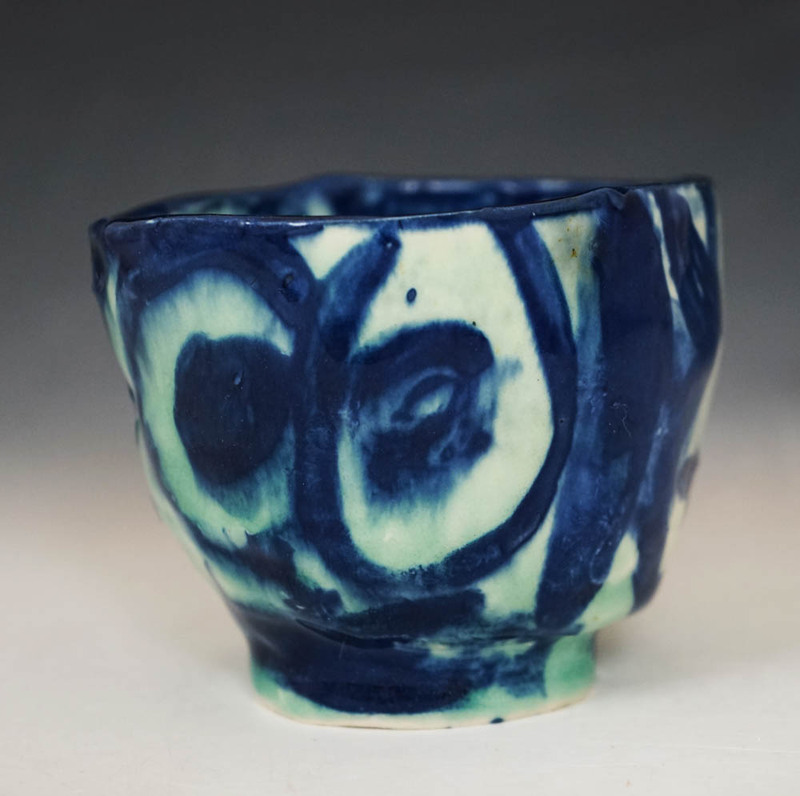 Lucie Rie for her forms and use of color, and the Korean ceramics for both form and surface design. Another big influence, would be the community of potters I have met in Athens. One thing that I appreciate is that they get together regularly to discuss their practices and discoveries in the studio. 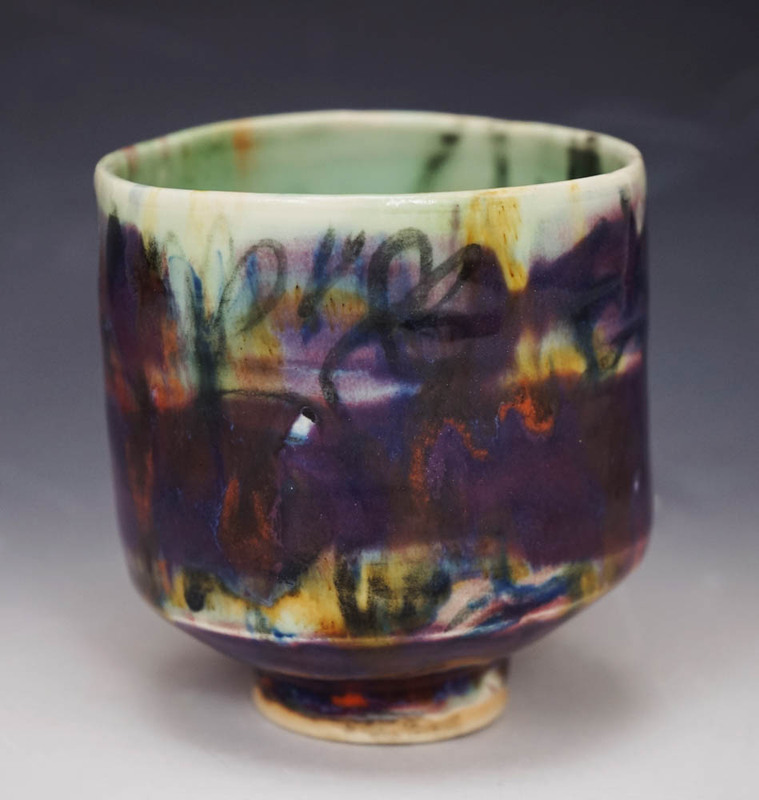 Do you see your ceramic work as meant to be used functionally? I like the idea that it could be used functionally or exist as an art object in and of itself. How have your experiences living in different places around the world affected your work? Did your time in Phnom Pehn, Cambodia leave a mark on your practice? I think that in general, when you travel and are exposed to different cultures and ways of thinking, this does have an influence on your life and work. The one thing that I remember about Cambodia, is the wild patterns people would wear in combination with each other. For example, a t-shirt with a mickey mouse pattern and plaid pants. Visually, I feel I have a broad vocabulary from which to draw from because of having lived and traveled to so many places. I’ve been fortunate enough to have met and gotten to know some very interesting and unusual (in the good sense of the word) people in my life. I have a husband who is a painter, and understands why I need to be in the studio. We have meaningful conversations about art and life in general. I’ve also met very unique artists here in Athens, New York, and Italy that I regularly correspond with. Very busy. I think of it as the three P’s. That would be painting, pottery and pure barre. Basically, I wake up, and I either head to painting or ceramics first. It depends on whether or not there is something about to dry out in ceramics or some pressing matter in painting. In the middle of the day, I make a mad dash to do some exercise at a place called Pure Barre, which is about an hour of physical torture that keeps me somewhat fit. Then, I switch gears either from ceramics to painting or vice versa. It’s very busy, but I am not willing to give up either practice so unfortunately, I don’t have much of a social life. Two days each week I also work as a dental hygienist at a large dental practice. There isn’ t a singular work that has totally changed me. There are things I have read that I continue to think about, like the poetry of Frank O’ Hara, Federico Garcia Lorca, and Pablo Neruda. At the moment, I am reading Kierkegaard’s Works of Love and a French cookbook. Currently, the Otis Redding, Al Green, Aretha Franklin stations on my Pandora is what I’m tuned into. It makes it feel less lonely in the studio. When they sing, I can feel it from the very first note. It’s very moving. Yes. It went something like: when you’re outside of the studio think about painting, the you get in there, it’s time for action. Where are you currently based? Can you tell us more about the community where you live and work or what makes the place work for you? I am currently based out of Athens, Georgia. It’s a good place to make work, but not to show it. There are a lot of artists here that are supportive of each other and the cost of living is lower than some other places. You can be as crazy and eccentric as you want. It’s a fun place to live. Thankfully, I am also able to travel and show in larger cities where there is a larger audience for the work. This year, I have plans to go to Los Angeles, NYC, and New Orleans. What are your go-to ways to find out about interesting shows or artists? Mainly by talking to other artists or through social media. If I am traveling, I will do some research on the internet to see if there are any interesting shows going on. What has been one of the biggest challenges for you so far in your career? What is one of the things that might be most beneficial to your career as an artist at this point? Acceptance of failure and making mistakes. Patience. Social media has benefits and drawbacks. For example, you can get a lot more exposure for your work than in the past and that may open up new opportunities. You can easily give someone a general idea of what your work looks like if you meet them traveling or really anywhere as long as you have a cell phone. However, I think people are easily swayed by things like how many followers on Instagram someone has etc and either consciously or subconsciously let that affect their judgement of the work itself. Those are two completely unrelated factors. I’ve seen artists with incredible work that hardly have any followers or even social media presence. Also, there is a strange kind of pressure to keep posting photos of your work. People often feel like they have then already seen the work and it may or may not encourage them to go see it in person at a show. What you see on the internet, and what you get in reality can be quite different. The Cinquecento in Florence. From Michelangelo and Pontormo to Giambolonga at the Palazzo Strozzi. I have a solo show coming up at Poem 88 Gallery in Atlanta this September. 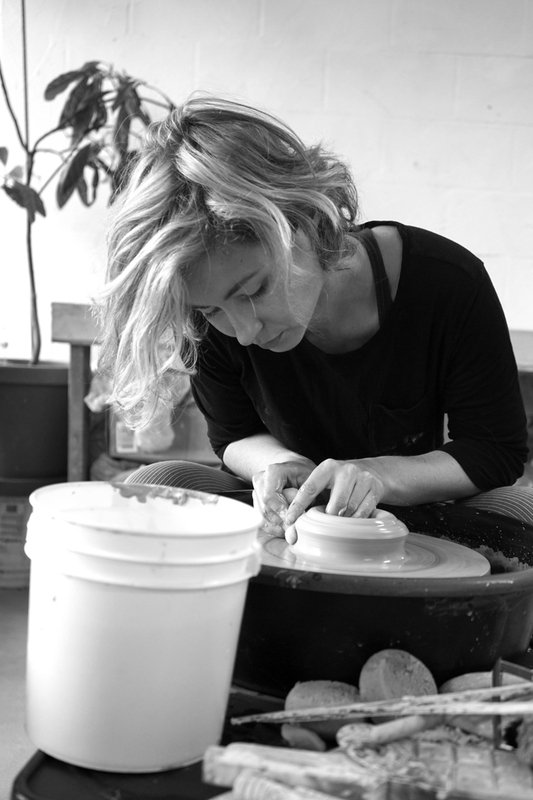 To find out more about Zuzka and her work, check out her website.